After a brutal storm blew across the eastern seaboard, temperatures dropped about fifteen degrees. My run yesterday was 6.4 miles at a 9:42 pace and that felt really good. I followed that up with 4.4 miles of bike rides; 2.2 each way to my men’s meeting of Alcoholics Anonymous. It was a good meeting and I needed one. I made a stupid mistake at work yesterday and sent an email that embarrassed myself. I doubt there will be any long-term consequences, but it’s definitely humiliating. But then I go to my meeting and there were two people who’ve lost relationships, another who’s lost a job. My problems are small. And none of us are drinking about it. The yellow “13.1” is a half marathon race we haven’t committed to yet. If we don’t do it, then that weekend will be a normal 13 mile drop-back training run. Distances shouldn’t, I am told, increase linearly. You kind of stair-step the long runs up to the full distance. 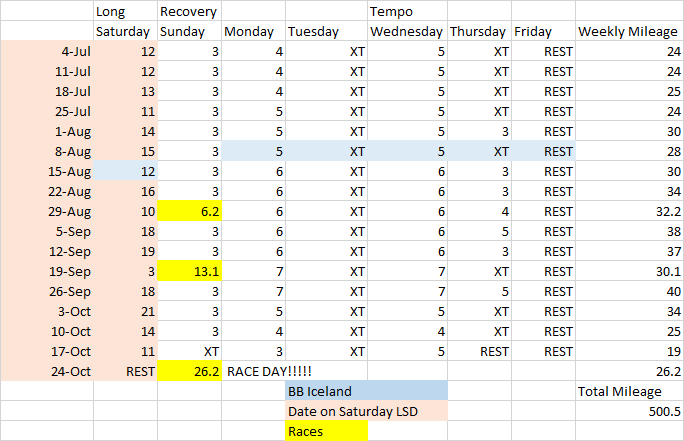 The drop-back roughly every third week allows some recovery, even in the middle of a long build. All this is leading up to the Marine Corps Marathon in Washington DC on October 25th. I’m excited about it. It’s going to be a real challenge. The longest I’ve ever run is 14.4 miles. I don’t eclipse that until August 8th. But I’m looking forward to getting into August and September and October and regularly running long runs on Saturday. Really long runs. As we get up to 16-21 miles, I guess I’ll see what I’m made of. I don’t have a time goal, though I’d vaguely like to finish in about four and a half hours. To do that, I’ll have to run at about a 10:10 pace. Right now, in my head, that sounds doable. But I don’t know. Right now, physically, I’m feeling good. My leg tightness from the spring is eased, and my neuroma is tolerable. I tried on jackets last weekend and I fit a 40R now! I feel fit. I’m doing a decent amount of crosstraining in the gym and on my new bike, which I really enjoy. I’m not losing any weight. I don’t know if I will. but I’m fitter than I’ve been in my whole life, and that feels good. It’s taken me a lot of time to get to a point where I can feel like I’m accomplishing things. Even though I’ve made some dumb mistakes, I’m getting things done at work. Even though I let myself become obese and nearly diabetic, I’ve made great strides in my health. I don’t drink. I don’t smoke. I run. I ride. It’s hard work, and requires a lot of discipline. But luckily, I’m a person satisfied by repetition and routine, and incremental progress. So that’s the plan. Run like hell. I think I can do it. And so I’m going to try. ← Running in the Heat. love this plan. it makes me think that I might be able to do a full marathon. It looks really challenging, but with the step-ups and step-backs, it actually looks doable!